Imagine, for a brief second, that chicken-fried steak didn’t exist. Gone from the Earth, that shattering crunch, that peppery gravy. The tender steak, juicy and jailed in that crunchy breading, wiped clean from our lives. You’re crying openly and wandering the streets for meaning, right? 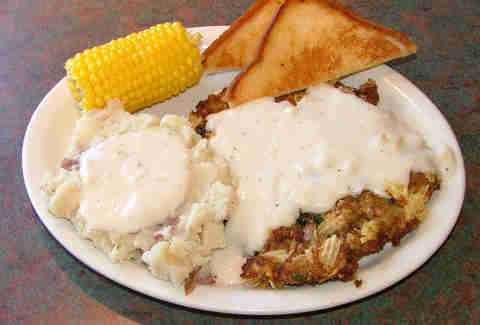 Chicken-fried steak, or more succinctly CFS, is, without question, a reigning king of Texas food icons. In Dallas, the CFS roots run deep. It happened in 2011: the mayor of Dallas proclaimed his message from high atop city hall that October 26th would be known, from then on, as Chicken Fried Steak Day. It’s a real day on your real calendar because it’s a true tradition in Dallas. Ignore the other poser national holidays: this came straight from the Office of the Mayor. Dallas’ Ed Murph, the owner of Norma's Café -- one of the best places in Dallas to devour CFS -- campaigned for this proclamation. Then, it was given to us with a great crown of green beans. The origin of CFS, according to the experts, is up for epic debate. Historians have pointed to weinerschnitzel, a breaded veal dish brought to Texas by German immigrants, as the origin. There’s also the famous story of Jimmy Don Perkins, a short-order cook in Lamesa who mistakenly saw two orders, “chicken," and "fried steak,” combined into one glorious, breaded request. If this is the true origin, we’re going to need a Godzilla-sized, solid-gold statue of Perkins in various checkpoints around the state... and perhaps the plaque should be forever deep-fried. Robb Walsh, former Austin Chronicle food editor, and the absolute must-read authority on CFS, says there are three versions of the dish to note: the East Texas version, which is the tenderized steak dipped in egg and then flour (like fried chicken); the Central Texas version, which boasts bread crumbs over flour in the same procedure; and the West Texas’ version, which is basically a pan-fried steak. No egg batter for that one. 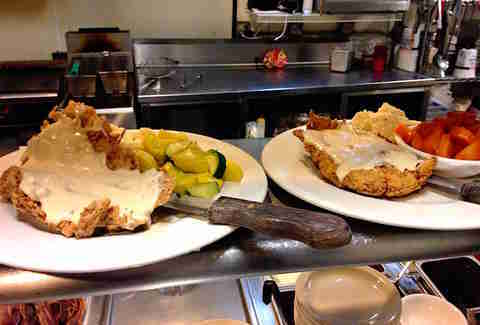 No matter the prep, chicken-fried steak is a historical landmark that tastes as nuts as it sounds. Good chicken-fried steak has scratch gravy, made in the skillet like a roux; is loaded with pepper, and has a crisp breading that stays close to the meat. Great CFS, the kind that alters your mind and body for the better, is a magnificent sensory experience of crunch and salt and creaminess and heat. Green beans, with their grassy crunch, are a perfect side. One bite of great CFS, and you can taste Texas sunshine before two world wars. But with great CFS comes great responsibility. When a dish of green beans, mashed potatoes, and a fried steak, big as the Texas flag, appears, you may think, “This has got to be easy to do.” Like some of the oldest dishes in America, it ain’t. CFS requires sharp execution, time, and, most importantly, a love of the dish. In Dallas, you can taste a pure, unadulterated love in the best versions. Canned vegetables and gluey gravy are not welcome here. Dallas’ versions are old-fashioned, dredged in a secret seasoned flour, or pressed with salty Ruffles chip crumbles, or smashingly deep-fried. When then-New York Times food critic Sam Sifton visited in 2011 for the Super Bowl, he marveled at Babe’s CFS: “New York has nothing to compare with the excellence of Babe’s fried chicken.” It’s true. All cities are hereby required to envy our chicken-fried city. 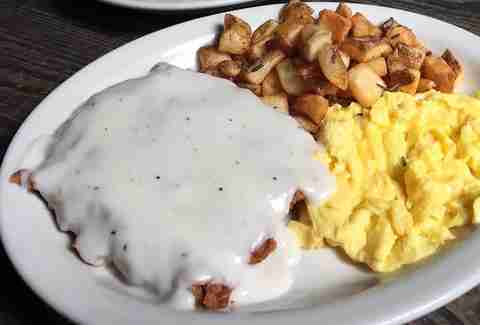 Chicken-fried steak is abundant in Dallas. There are good versions, and then there are the ones that truly stick to you for a long time... the ones that taste like Hill Country in spring, or a ranch hand clapping the dust off of gloves. These are the chicken-fried steak dishes in Dallas that will alter your DNA. AllGood Cafe executes chicken-fried steak with NASA-like mathematical exactness. The tenderloin steak, hand-pounded thin, is fried in peanut oil, which sheaths it in a crunchy armor. The scratch gravy (made from a stock of roasted chicken bones) is decadent, peppered with heart and rich homemade flavor that will give you palpitations. With green beans and a side of homemade mashed potatoes, it’s a sublime dish that tastes exactly of the state that you love. There are so many joyous bullet points about the CFS at Tom’s Burgers & Grill. The fried crust is made of Ruffles potato chips. It’s one of seven secret ingredients (another teaser: the steak gets a buttermilk bath). Tom’s Burgers serves chicken-fried steak in three ways: the good old-fashioned way, with garlic, red mashed potatoes and Texas toast; between slices of buttered, toasted brioche; and for breakfast with two eggs, hash browns, and toast. The eponymous Tom says “we make them fresh every morning and sometimes again before the dinner rush.” Salty and crispier than your wildest CFS dreams, this has got to be one of the most unique CFSs in Texas. This version of CFS is so crunchy that one bite will shatter glasses. The recent uptick in Dallas earthquakes has been mistakenly attributed to fracking. It’s not fracking, it’s the crunch of Ellen’s chicken-fried steak. Ellen’s is top round, dipped in seasoned flour (self-rising flour makes for fantastic crust here), and deep-fried. Get the creamy gravy served on the side. Mow through pieces, dipping your delicious wedges into gravy along the way, and you’ll experience Richter scale-registering happiness. You know the power of Norma’s, a staple on Davis St for more than half a century. If chicken-fried steak is a superhero dish, then Norma’s version is Batman. It takes inside round steak cuts -- Norma’s confirms they run it through a tenderizer four times -- dipped in a mix of egg, milk, and flour spiked with hush-hush ingredients. It’s the original, punch-to-the-face good diner-style fried steak. 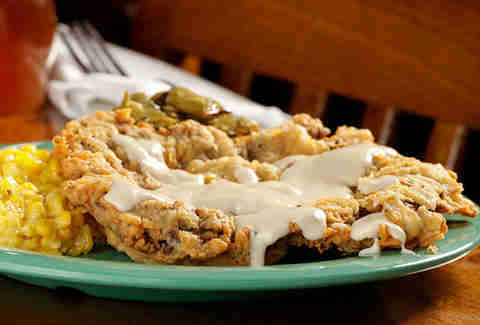 If you think of your plate like a clock, Babe’s chicken-fried steak spans 12 hours. This plate-sized, juicy, and fork-tender steak is a masterpiece. It’s a delicious slice of the moon. Babe’s superpower comes in the form of the crust. Few things crunch like the breading at Babe’s. You’ll feel the power of it from brain to feet. Juicy steak hides modestly in that fried crust; dip it in the gravy bowl for a dish that transcends space and time. Very good things happen to the chicken-fried steak at Ozona. After a bath of buttermilk and flour seasoned with secret ingredients, Ozona has been known to put cutlets under the baskets in the deep frier. Queso sometimes is ladeled on top. The Travel Channel says Ozona’s CFS is the “stuff of legend,” and authority Robb Walsh featured it in his epic list of lovable CFS. 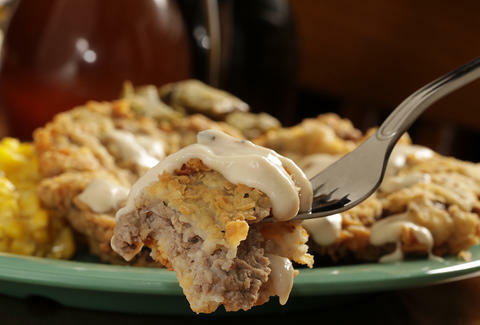 Chicken-fried steak will always be the stuff of Texas legend. Nick Rallo is a writer in Dallas. His reviews on burgers appear weekly in the Dallas Observer, and he's slowly replacing his body with gravy. Follow him @nickrallo.